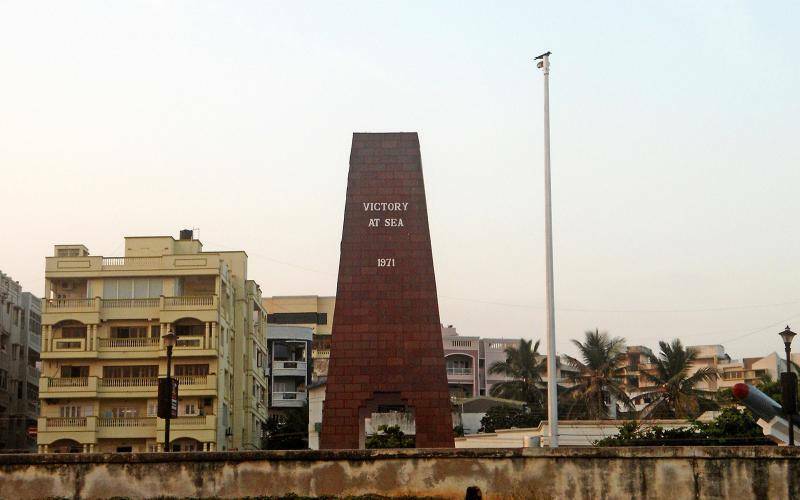 Victory at Sea War Memorial was built in the year 1996 to commemorate the Victory of Indian Navy's Eastern Naval Command (ENC) in the 1971 War with Pakistan and to pay homage to all Indian war martyrs. It is located near Ramakrishna Beach near to the Submarine Museum and consists of a tri-service representation of artifacts on the seafront. “The nation that forgets her defenders needs no ancestors” is engraved on the central tower’s base. A T-55 tank symbolizing the land component and a fighter plane embodying the power in air are displayed here. Other eminent exhibits are the P-21 Surface to Surface missiles that wreaked havoc at the Karachi harbor on 4 Dec, 1971 and the RZ-61 Surface to Air missiles that helped the frontline battle ships. There is no entrance fee and photography is not allowed inside. It is open from 10.30 AM to 7 PM.